£50 Key deposit is additional to the holiday cost and reserves your dates. This is returned after your stay if all is in order. More info is available when booking forms are sent out. 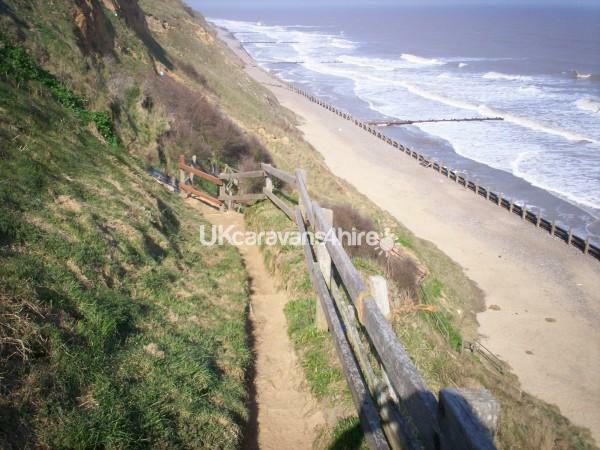 Kiln Cliffs caravan park is a 10 minute coastal drive east of Cromer. A picturesque peaceful family site where you cannot fail to totally relax and unwind. Seaviews and spectacular sunsets. You will not want to leave. You will want to re book. Fully equipped caravan offering value for money bargain breaks. 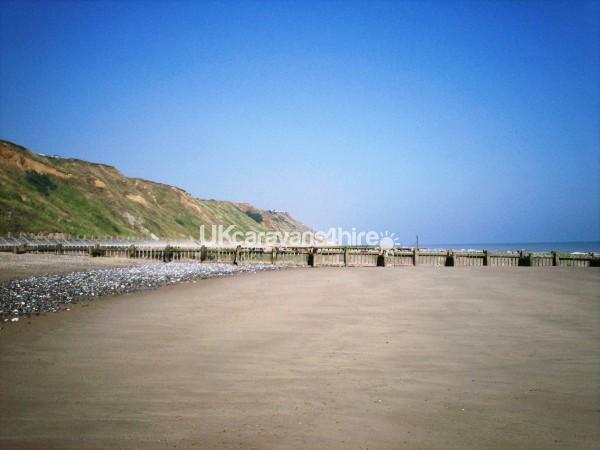 Mundesley is a quiet coastal village with numerous pubs and clubs, crazy golf, takeaways, shops, Church and a library. Within easy reach of the site are many reknown nature reserves and bird / wildlife sanctuaries such as Seal Island. Many historical interests are within easy reach such as Sheringham Poppy line steam railway, Sandringham House and the ancient historical city of Norwich. Family and adult only swimming sessions can be found at the nearby SAGA Mundesley Holiday Village - 3 mins by car, Woodland Park Resort 10 mins, North Walsham Leisure Centre pool or the public pool in Sheringham 20 mins. Review: "Lovely caravan, brilliant sea views. A nice relaxing break. Hope to come again." Review: "great caravan, had everything you could want and more. Very clean, 5 star plus. Will be back again and again if you will have us." Review: "A fabulous short break with excellent accommodation, we hope to be back"
Review: "We had a fantastic holiday, weather was fab came back looking like we've been abroad for a week!!! Caravan was excellent, had everything and more we could've hoped for!! and had a brill stay and I have no doubt we will book with you in the future!! excellent!! Pull out bed not too comfortable though. " Review: "Idyllic sheltered position, on quiet and peaceful site. Totally relaxing week. Well equipped caravan with all we needed and no bedding to take home. " Review: "Another fantastic stay! Super caravan, great location and our son really enjoyed the play station "
Review: "Thanks again for the use of one of your great caravans." Review: "Totally unwound. Kids and dogs loved the miles of clean beach. Fully recommend a holiday in this modern caravan. " A lovely caravan, a brilliant view, opening the curtains every morning. We had a perfect holiday. Many thanks for your review Rob and Christine, you travelled a long way, you needed a comfy bed! Hope to hear from you again for 2019. Well equipped clean caravan. Comfortable and very quite site. Stayed on that site many years ago when they had chalets. I must say the site hasn't changed much since. It's still as peaceful and clean. We loved the view from the caravan overlooking the sea and we all had a great time and were sorry to leave. We wouldn't hesitate to go back there. Only one criticism. Under the shower door in the bathroom is quite a lot of rust. Thank you Adam. Adam was a star !!! Cant wait until next year ! We all had a super time and will book as soon as we know our holiday dates. The site was great and the van was lovely ! Thank you from us all. Our second stay in this caravan and once again we really enjoyed it. The caravan is spacious but also cosy, clean and with little added extras. The view is beautiful! Adam's communication is brilliant, he replies to all messages very quickly and is really organised with payments and key transfer. We have stayed in Adams caravan a number of times and never fail to have a relaxing holiday. 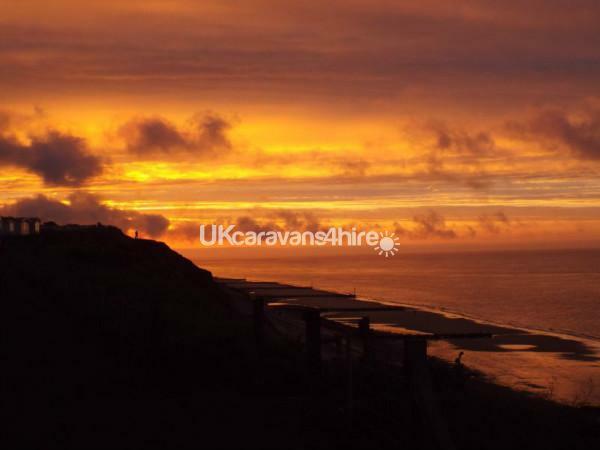 The caravan has everything that you need and the views out to sea are lovely. Communication with Adam is brilliant and nothing is to much trouble. This is my 3rd stay in Adams caravan, as usual the caravan was very clean and tidy. 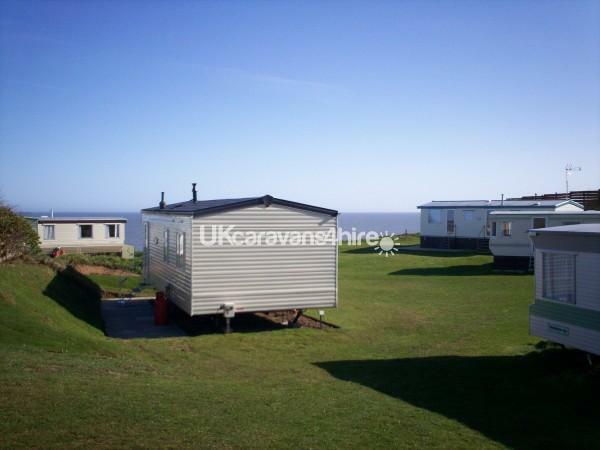 the site is excellent, quiet, clean with a great view of the sea from the caravan. I would recommend the caravan to anyone who likes a relaxing holiday with great walks along miles of sandy beaches. Thank you for your review, I look forward to you staying with me again. Just a fantastic caravan - it's not new by any means but very clean, tidy and confortable. The location on the park with the sea view are far better than I envisaged. The equipment provided exceeds all expectations; windbreakers, outdoor chairs, bbq, books, games, crockery etc. You usually only get the basics provided. One of the best showers I've ever had in a cravan - nothing wrose than a dribble coming out of the shower rose. Highly recommend and Adam is a great host in terms of availabilty and communication. Thank you for a wonderful review. I look forward to letting to you again. My pleasure, please tell your friends. 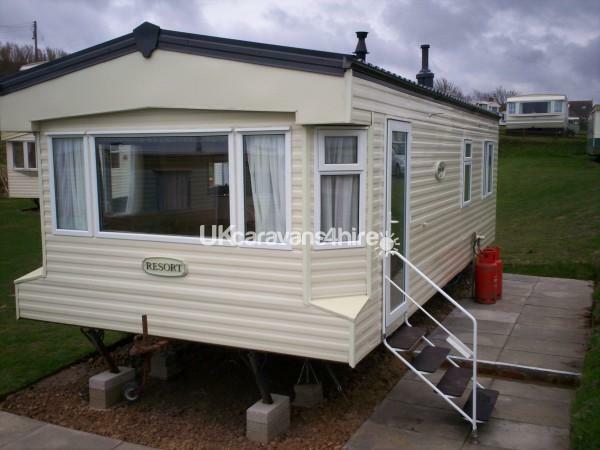 Lovely caravan in a great location with a wonderful sea view. The van was clean, well equipped and spacious. Adam's communication skills were excellent - he was very friendly and helpful which made everything run smoothly. We would love to visit again in the future. Many thanks for this wonderful review, I always strive to give my guests what I would expect to receive myself when booking a caravan holiday with my family. I look forward to another booking. We sent Mr Dovey lots of emails with questions prior to booking and he answered and replyed all our questions quickly. Sadly we couldn't make our booking in July, Mr Dovey dealt with our cancellation compationately and even refunded our deposit. 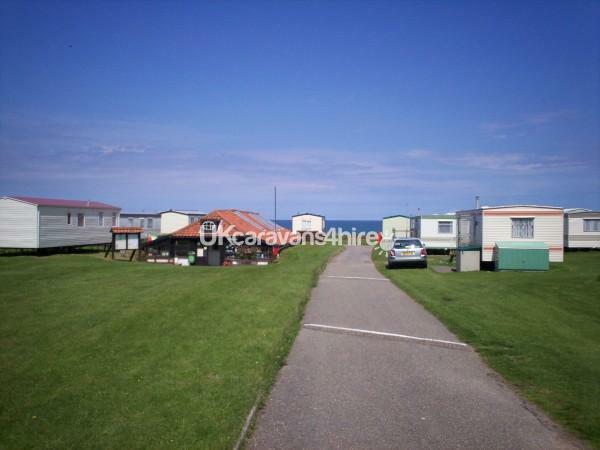 Nice site, v.good caravan,every thing you could want is in the caravan,very nice to have a good sea veiw.youve got shops and chip shop plus a chinese with in 1 mile. Comfortable and well equipped caravan in nice quiet position. Ideal for a break away from it all, access to beach a short walk away. Fantastic dog walks. Highly recommended. One suggestion though – it would be helpful if the outside light was working. Also I found the TV/DVD arrangement confusing (but that’s probably just me!). THIS IS VERY WELL CARED FOR CARAVAN AND THE SITE IS VERY PEACEFUL. VERY HANDY FOR TOURING AROUND NORTH NORFOLK. IT ALSO HAS A SEA VIEW. EXCELLENT PLACE, I LOVE IT.